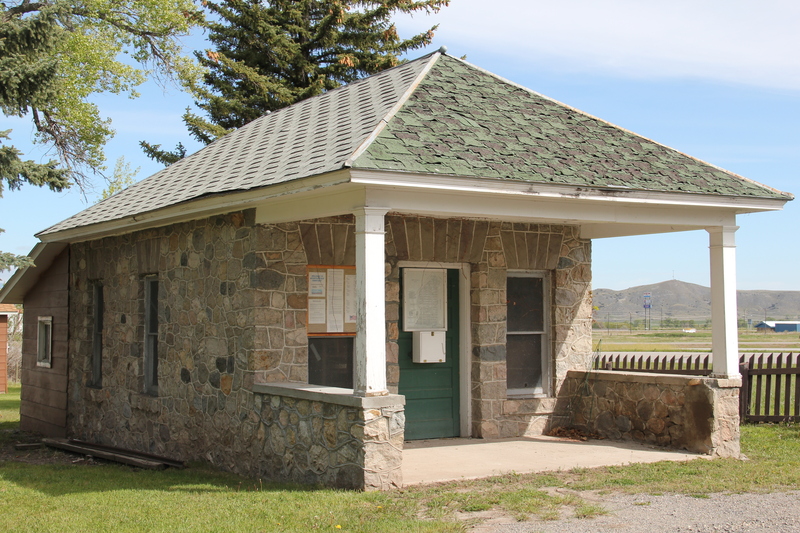 As part of my May 2018 trip to Montana, I stopped in Big Timber to see if anything was left of the historic Sweet Grass County High School of 1905. 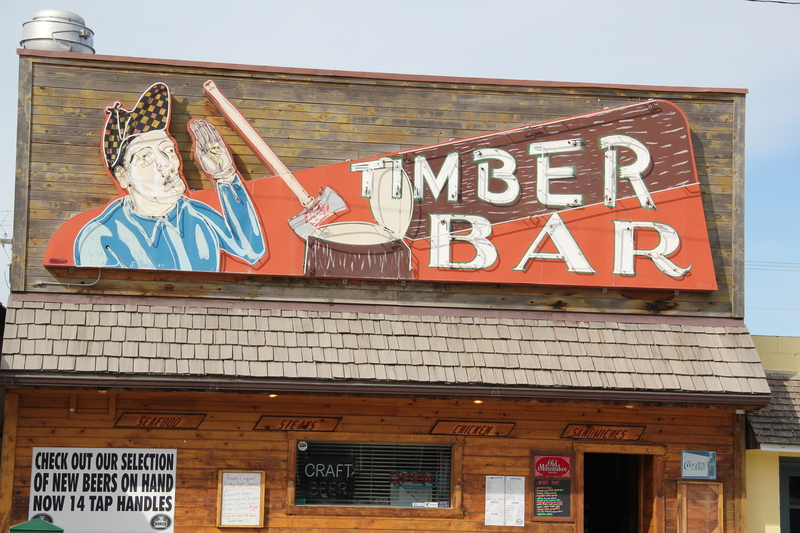 When I first viewed the large two-story building that rests on a full basement story in the early 1980s, I thought here was a classic statement of public architecture–a building that in its size, style, and purpose matched the ambitions of Big Timber on the eve of the homesteading boom to come. 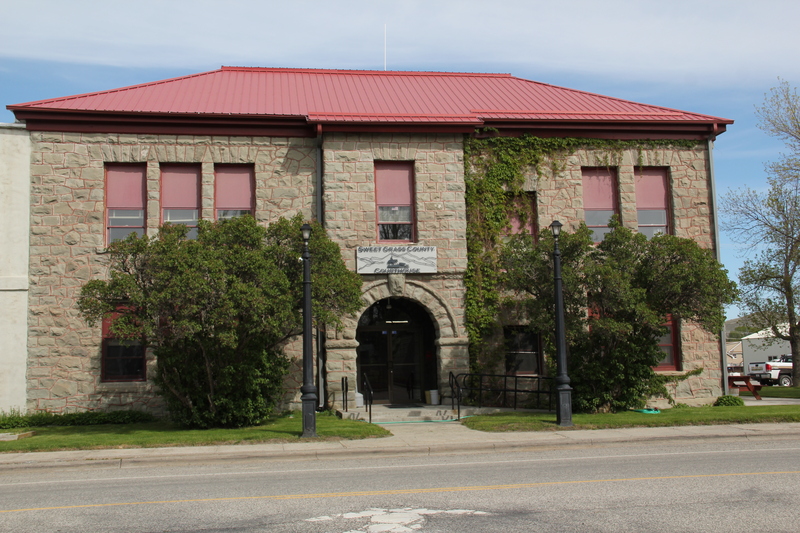 But in 2014, when I took the photograph above, I thought that the school’s days were numbered–how do you find a new purpose for a building this large in a town this small? 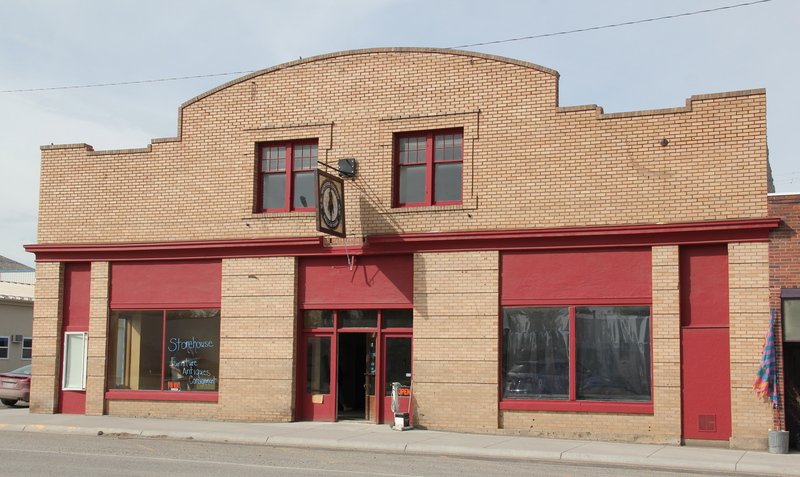 What were the adaptive reuse possibilities? It was clear that without a new purpose, the historic high school would not survive for much longer. Then in October 2017, someone set a fire that almost totally destroyed the school building. When I pulled into Big Timber the following May, I expected to see a parking lot or at least an empty lot (the local Episcopal Church had purchased the property). 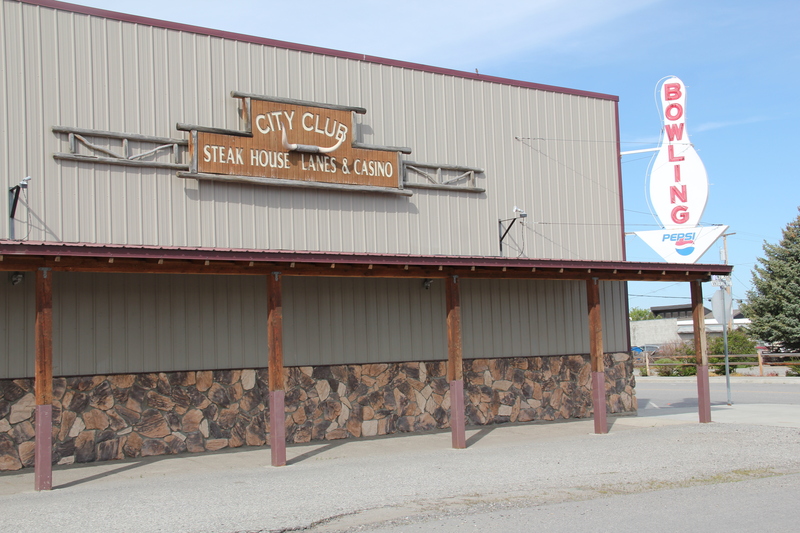 The damaged building was still there, however, giving me one final chance to take an image, one that now represents dreams dashed, and yet another historic building gone from the Montana landscape. 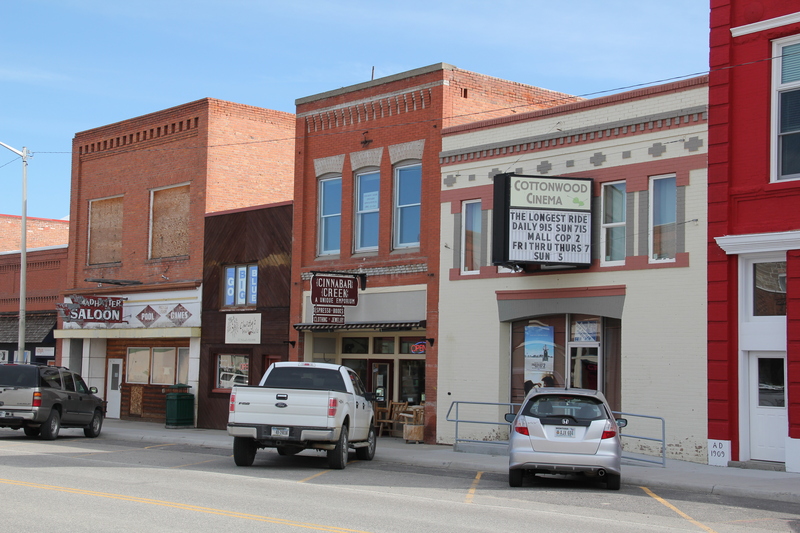 Big Timber and Sweet Grass County, in the heart of Montana’s Yellowstone Valley, create an imposing built environment set in a beautiful county, framed by mountains and defined by historic river corridors and later transportation routes. 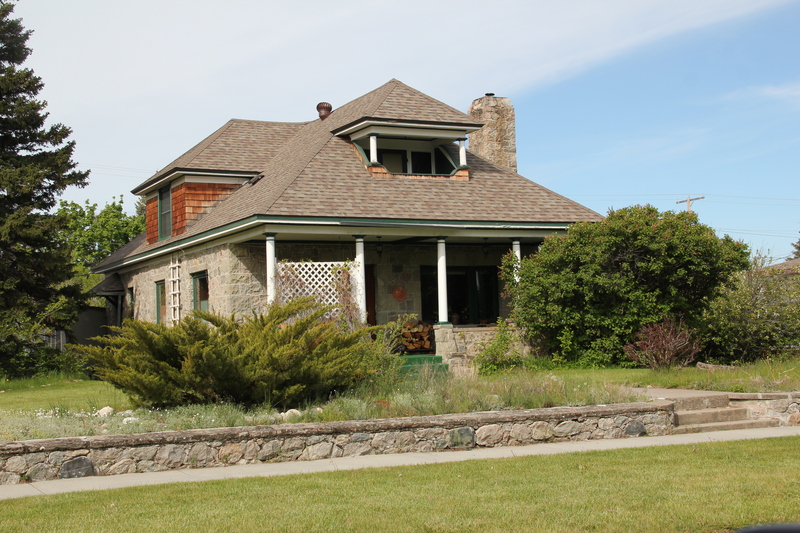 In the last post, I focused on Big Timber, its public spaces, its town plan, and the properties there already listed in the National Register. 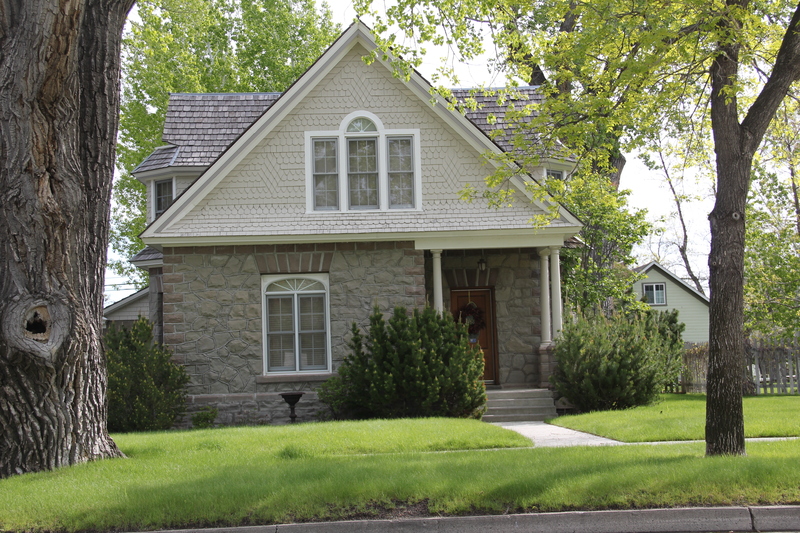 Today I want to focus on other just as worthy historic properties found both in town and in the county. Let’s start with landmarks from the New Deal era. 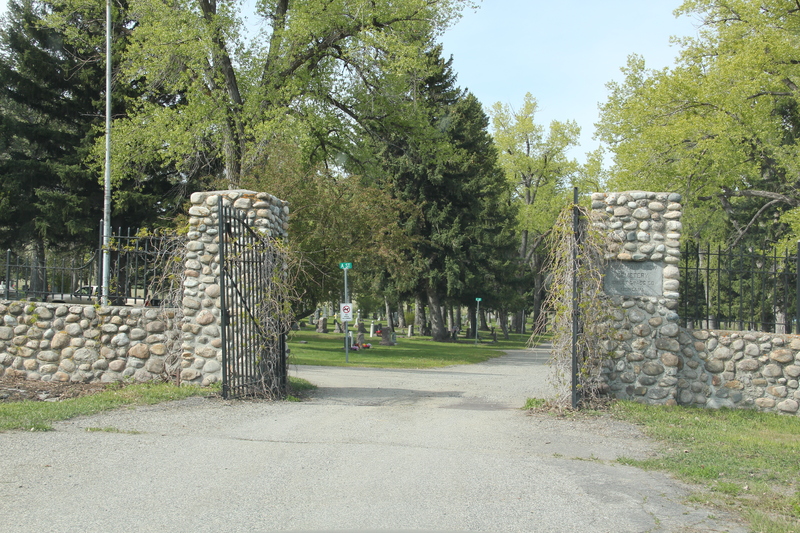 The town city hall/ fire hall is recognized but just southwest of Big Timber is the Mountain View Cemetery, which received a new stone gate, cemetery office, and other landscaping improvements from the WPA in the late 1930s. 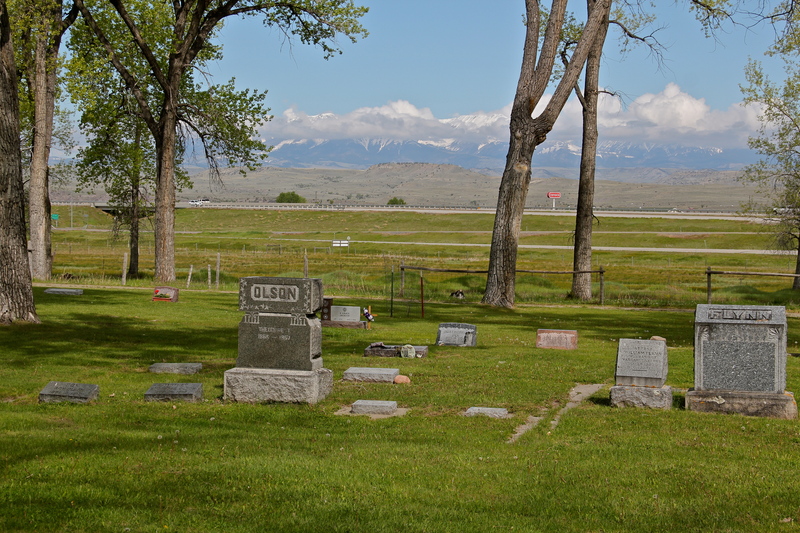 It is a splendid small town historic cemetery, with its majestic setting providing a proper dignity to those town founds, and generations of later residents, buried there. 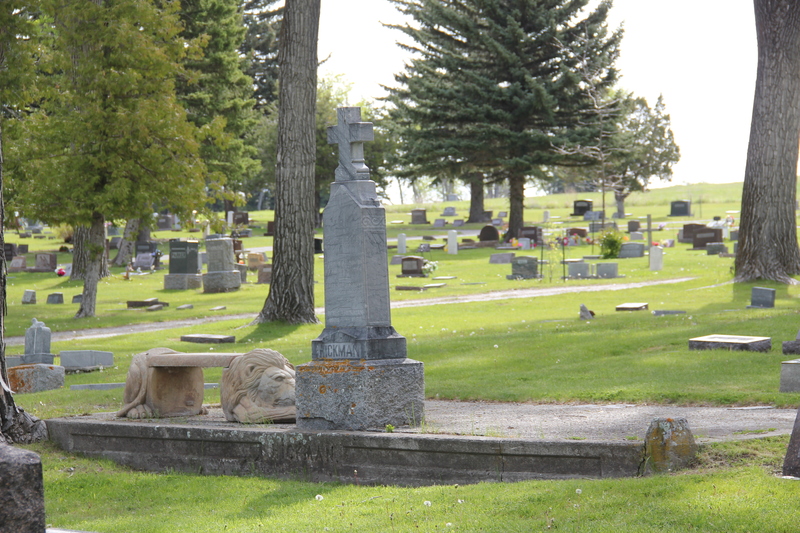 The beautiful stone masonry of the cemetery reflected a vernacular theme already noted in the Sweet Grass County Courthouse and St. Mark’s Episcopal Church. 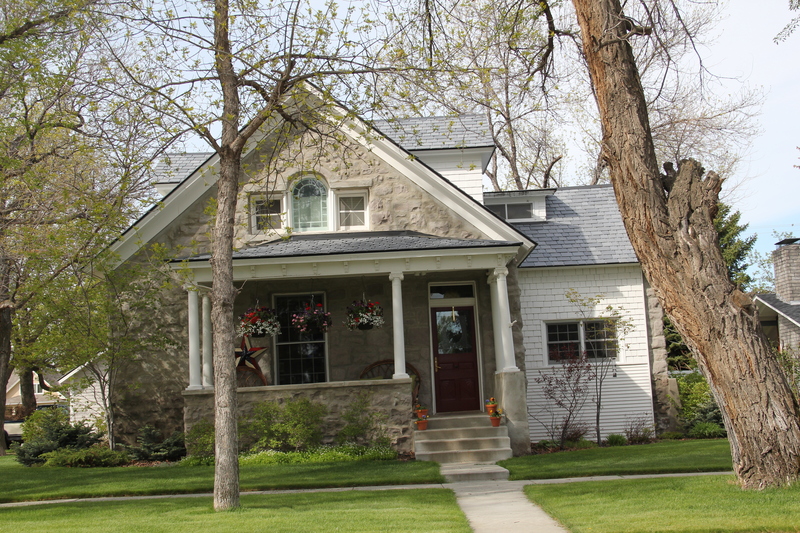 But the smart use of stone throughout the town’s residential district is a significant design theme, from the magnificent Lutheran Church above to numerous examples of early 20th century homes. 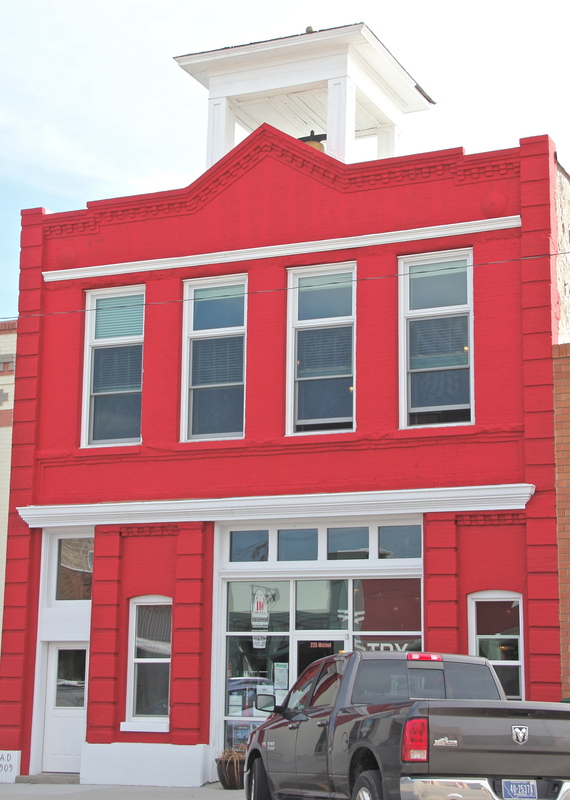 Certainly community landmarks are a useful way to think about Melville, once an important trade town at the north end of the county on U.S. Highway 191. 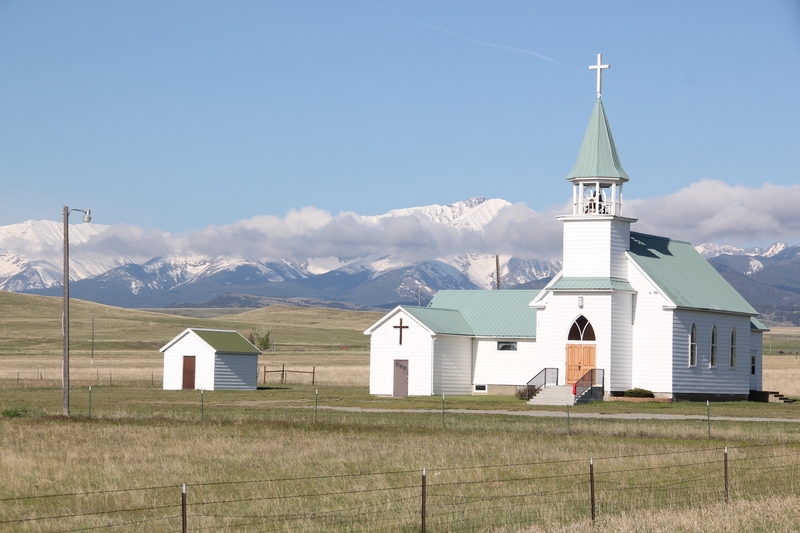 The town now lies just west of the realigned highway but it is worth a brief detour, if for no other reason than one of the state’s great rural churches, the Melville Lutheran Church. 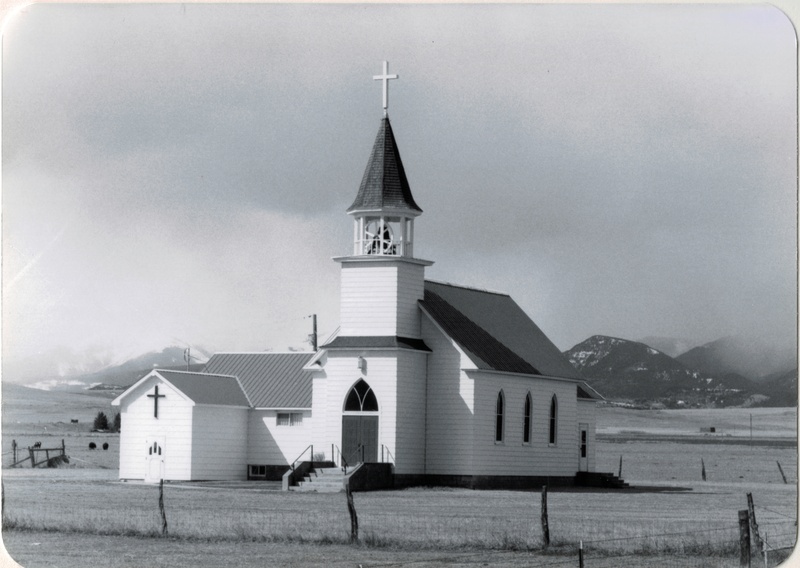 When I encountered this gable-front vernacular Gothic church in March 1984, its unadorned beauty framed by the Crazy Mountains was a take-your-breath away experience. 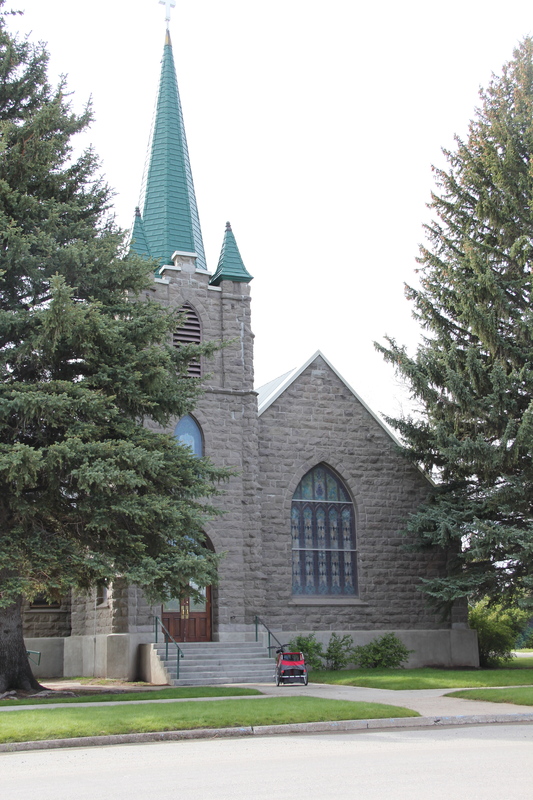 I featured the church in my A Travelers Companion to Montana History book on page 121, and noted the congregation, established in 1885, had built the church in 1914. It has weathered the subsequent 100 years well, as the image below shows. 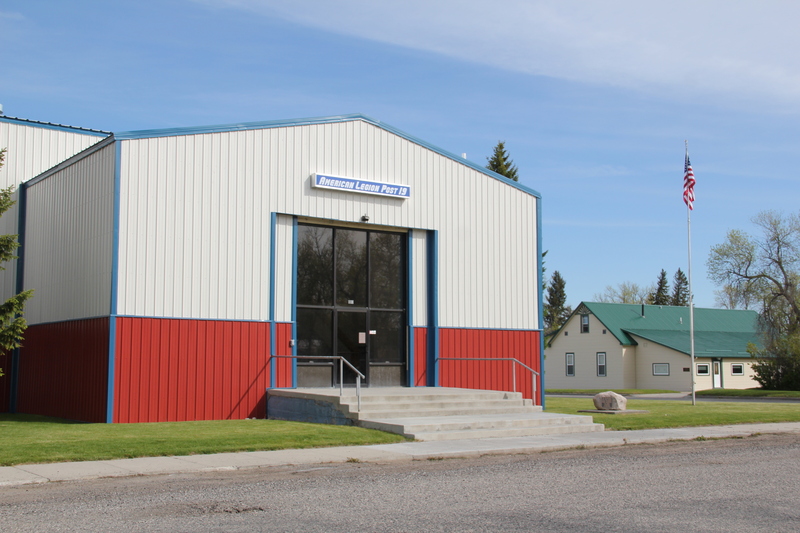 The stewardship of the congregation in maintaining the building, when so many other rural churches have closed in the last 30 years, is to be congratulated. 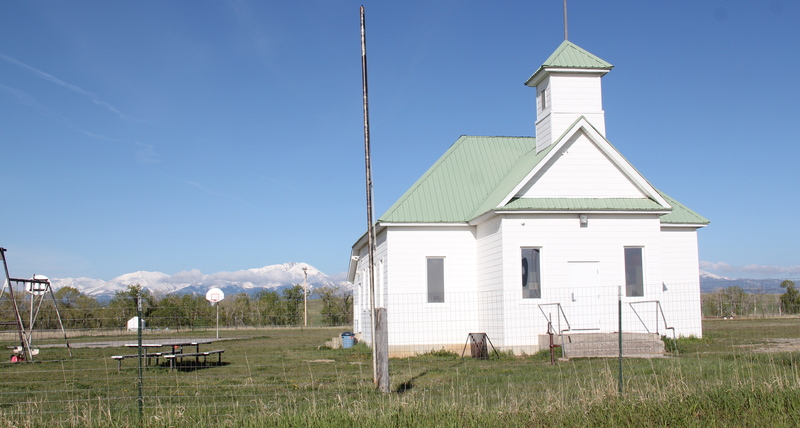 But Melville has more than the church–its rural school is still there, and probably as old as the church, serving as public space within the shadows of the Crazy Mountains. 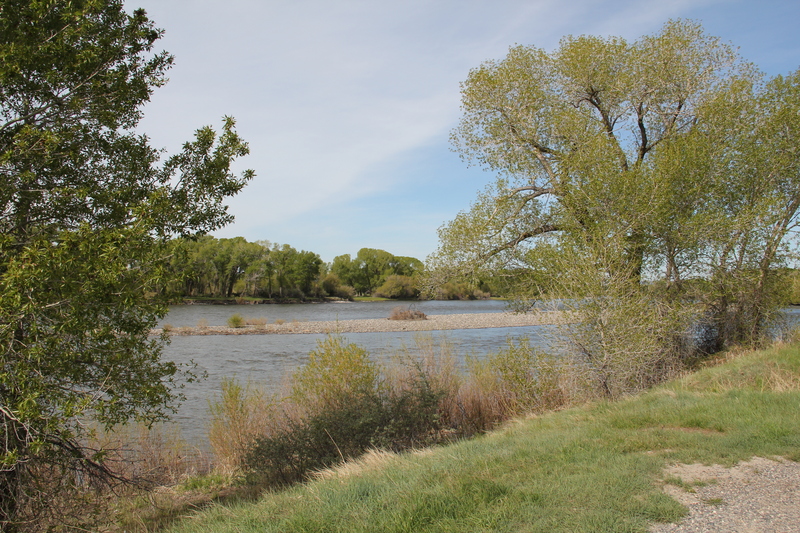 Finally, back in the center of the county, let’s close with the Yellowstone River. 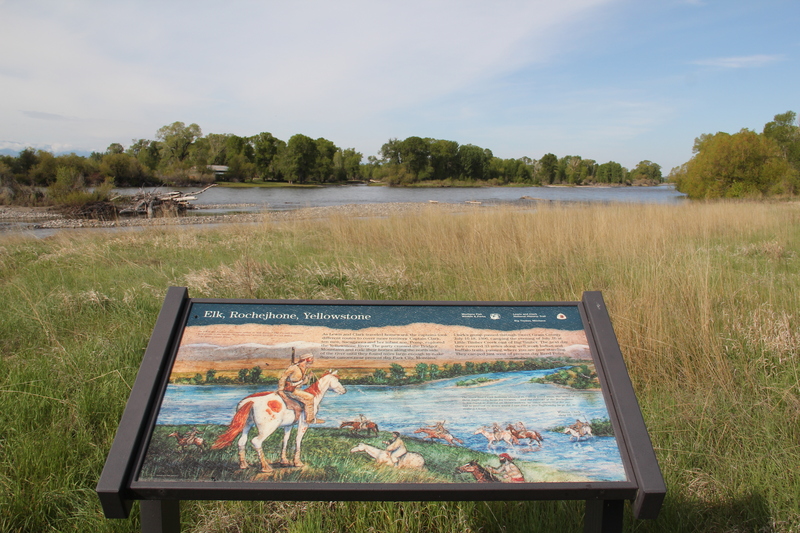 Now at a public access site just north of Big Timber and just west of U.S. 191 is a Lewis and Clark National Historic Trail site that interprets the expedition’s experience at this spot in 1806. 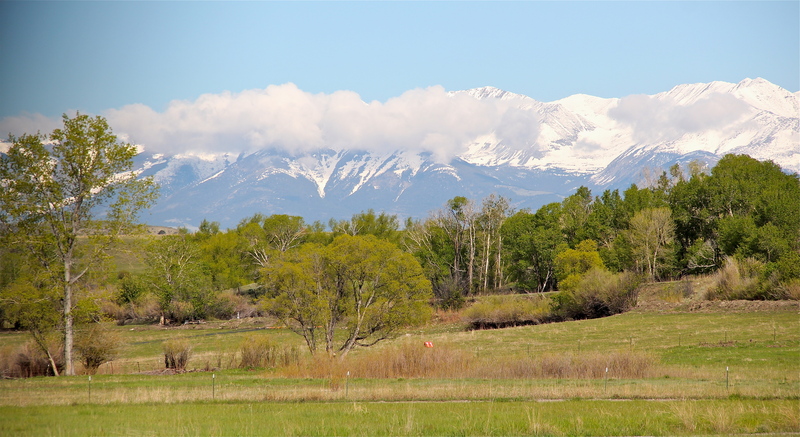 This beautiful spot sums up the special quality of Sweet Grass County–a beautiful natural landscape that has been shaped in expected, and unexpected, ways by 200 years of history. The Lazy J, near the intersection of U.S. 191 and old U.S. 10, is a classic bit of mid-20th century roadside architecture. which strikes northward cutting across Central Montana and continuing until the highway ends at the Canadian border, north of Malta. 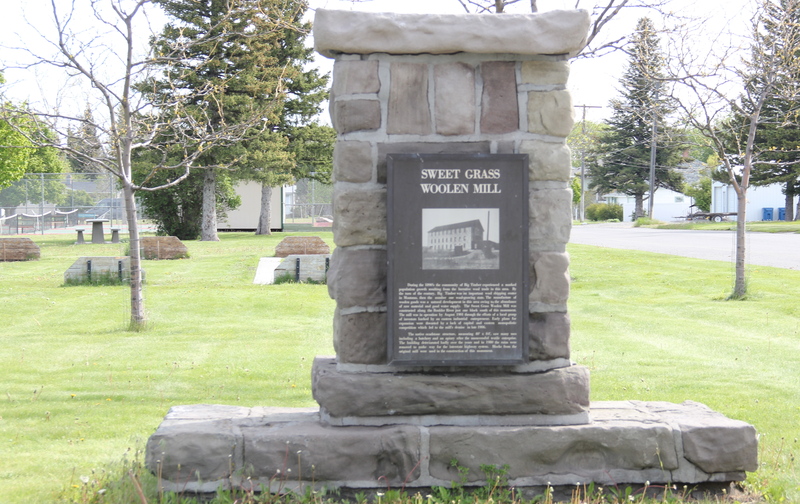 effectively marks the end of the historic town. 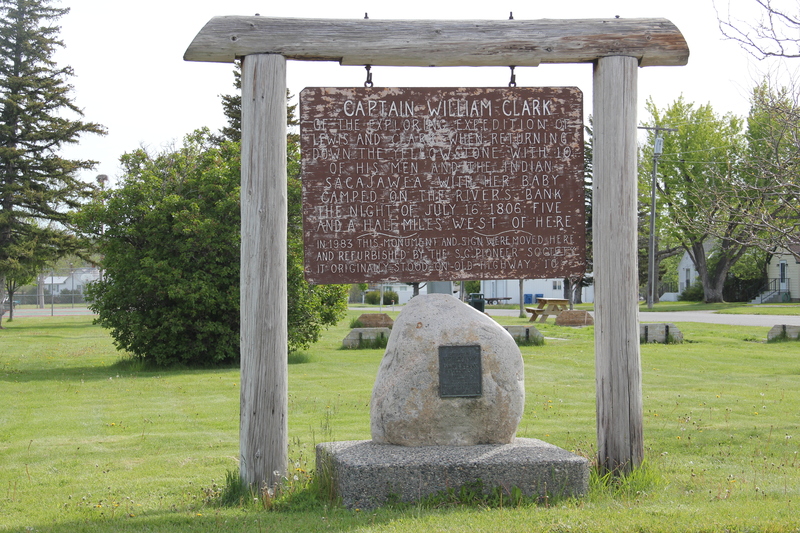 When I first surveyed the town in 1984, I found that an old 1946 highway marker for the Lewis and Clark Expedition had been moved to the park a year prior to my visit, and the interpretive sign told me that the town had a sense of its place in history. 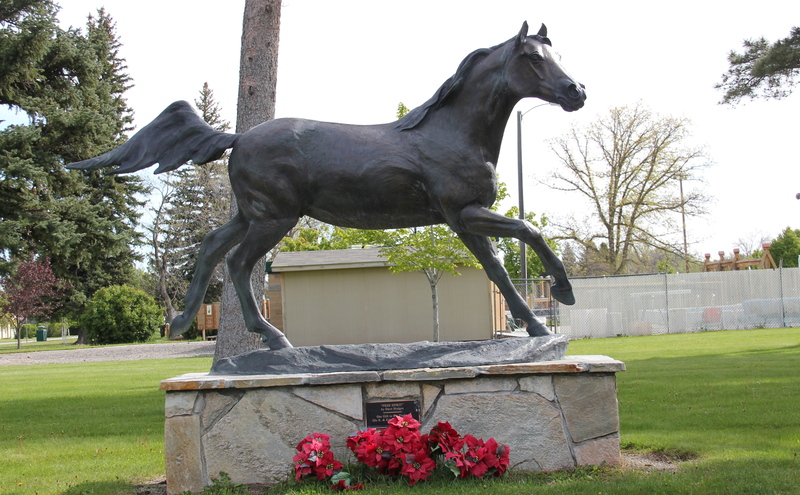 In the decades since, residents have added a monument to the town’s early wool industry along with a bronze sculpture, titled “Free Spirit” by Dave Hodges, linking the place to the open spaces and cowboy culture of the valley. 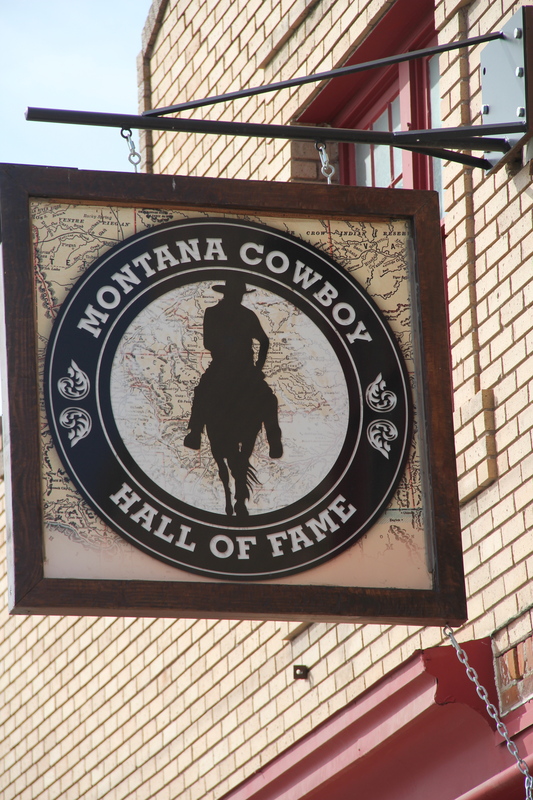 Coming soon will be the new headquarters for the Montana Cowboy Hall of Fame, an institution that searched high and long for a home until finding Big Timber. to head to Montana. 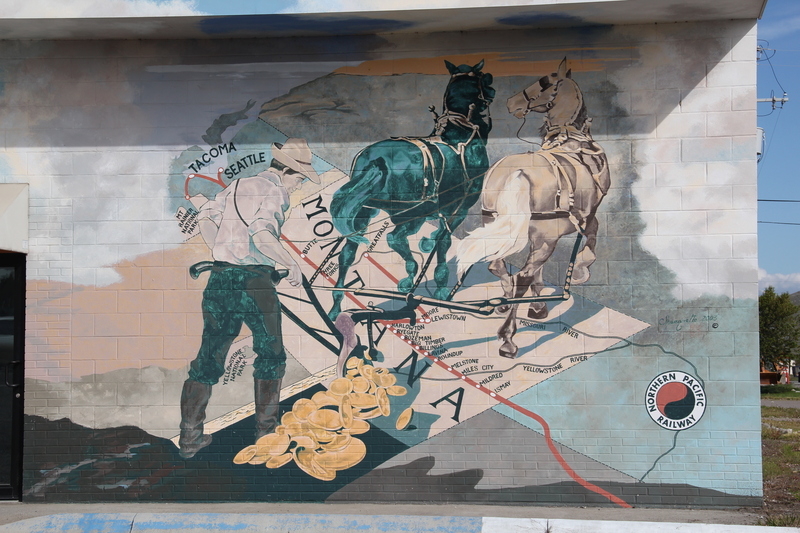 Oddly the reproduction mural gives the Northern Pacific corporate emblem but the route shown is the Milwaukee’s route, admittedly also showing where the two lines ran side by side in parts of the Yellowstone Valley. 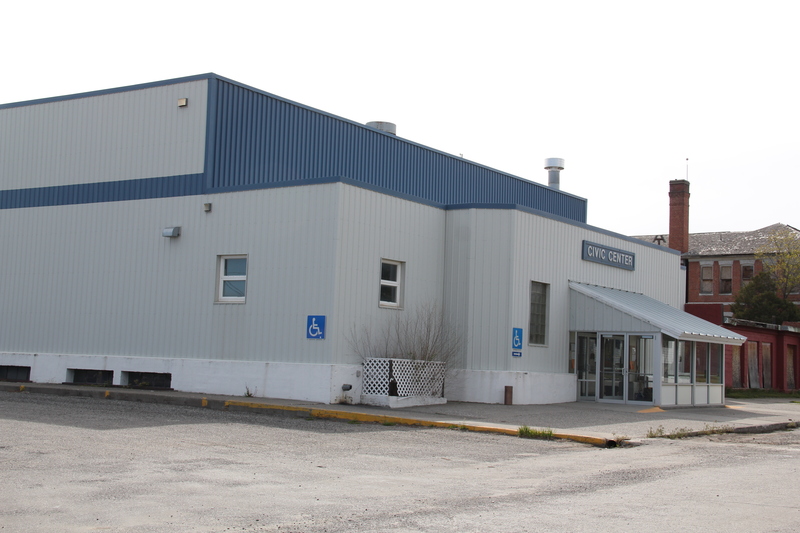 Timber City Hall. Little doubt these landmarks are cherished–when more library space was necessary this century the expansion of the historic building was done appropriately, keeping this landmark in service for decades. But when you consider just how intact the town’s historic environment from the 1880s to the 1950s is today, you think a National Register historic district nomination in order, or at least one for the historic commercial district, which has a wonderful array of building types, designs, and, luckily for Big Timber, open businesses, including one of my favorite bars in all of the state–at least favorite bar signs–the Timber Bar. 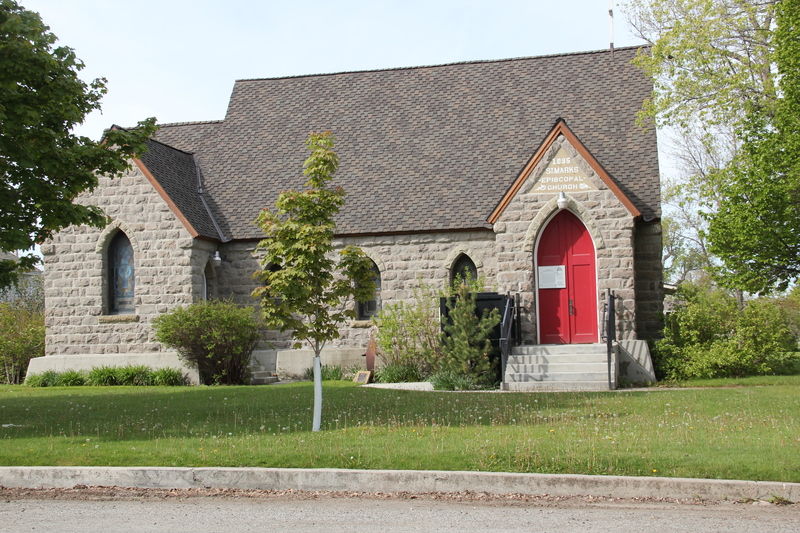 The next post will look deeper in the historic buildings of Big Timber, and then stretch north to a real jewel, the Melville Lutheran Church.